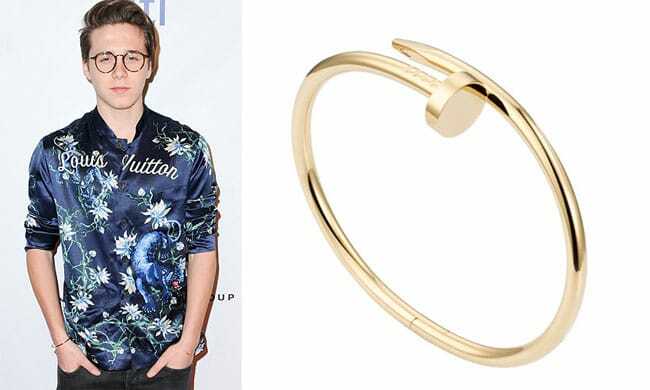 Brooklyn Beckham's favourite accessory might surprise you... | HELLO! Not only has Brooklyn Beckham inherited his father David Beckham's good looks and knack for soccer, he also has a flair for fashion, thanks to mum Victoria Beckham. The stylish teen isn't afraid to experiment with his look, and even dares to push the boundaries - especially when it comes to his accessories. Recently, the oldest Beckham boy was seen at a Grammys afterparty in Los Angeles. At first glance, there's nothing too noticeable about the outfit. However, if you take a look at his right wrist, you'll notice that Brooklyn is actually wearing a women's bracelet. It's not just any bracelet, either. That gold beauty is Cartier's Juste un Clou, an 18-carat bracelet that costs around £5,000. This popular Cartier accessory has been seen on the wrist of many famous ladies, including Kendall Jenner, Olivia Palermo, Karlie Kloss, Miranda Kerr and Kristen Stewart. According to the French fashion house, the design is "the expression of a rebellious nature and the reflection of self-belief" and "both modern and daring". Brooklyn was again seen wearing the bracelet a few days later at an after party for the BRIT Awards in London. It seems as if the 16-year-old has a new favourite accessory! Fans are waiting to see if Brooklyn will take after his mother and start a career in fashion, or if he'll go down the soccer route like his father. He does have a few modelling gigs under his belt, but seems to be more comfortable in front of the camera. In an interview with Miss Vogue about his future, the teenager said: "I love football, but I'm also very passionate about photography and film. I'm keeping my options open right now." Recently, he was chosen to be the photographer for Burberry's latest fragrance campaign.